For the village in Constanța County, see Deleni, Constanța. For similarly named places, see Pietroșani. "Pietros" means "stony, rocky" in Romanian. The city of Petroșani was founded in the 17th century (around 1640). In 1720, an Austrian cartographer mentions that the entire Jiu Valley was intensely populated and settlements could be seen from one end to the other. During the 1818 census, Petroșani had 233 inhabitants, while the entire Valley counted 2550. During this time, the main activity of the people was shepherding and no urban settlement had appeared yet. Around 1840 coal surface mining began in Petroșani, Vulcan and Petrila. The population experienced massive growth only in the 20th century during the communist regime, as many workers were brought in from other parts of the country. As other cities from the Jiu Valley, throughout the second half of the 19th century and most of the 20th century, most activities in the city revolved around the mines. But after the fall of the communist regime, many mines were closed, and the city, just like the whole valley, was forced to diversify the economy. 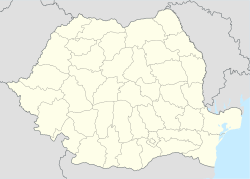 This has also led to a significant population decline: Petroșani is one of the Romanian cities which has experienced the fastest population loss from the 1990s onwards. Petroșani is located in the Jiu Valley, which is the entrance to the Retezat National Park and provides access to the Vâlcan, Parâng and Retezat mountains. The city administers four villages: Dâlja Mare (Nagydilzsa), Dâlja Mică (Kisdilzsa), Peștera (Zsupinyászuvölgy) and Slătinioara (Szlatinova községrész). Sfinții Arhangeli Church ("Holy Archangels Church"), built in the 18th century. At the 2011 census, 90.59% of inhabitants were Romanians, 6.54% Hungarians, 1.82% Roma and 0.35% Germans. At the 2002 census, 83.3% were Romanian Orthodox, 7.2% Roman Catholic, 3.7% Reformed, 2.2% Pentecostal, 0.9% belonged to another religion and 0.8% Greek-Catholic. ^ "Topul localitatilor cu cea mai dramatica scadere a populatiei". hotnews.ro. Archived from the original on 23 October 2017. Retrieved 26 April 2018. Wikimedia Commons has media related to Petroșani. This page was last edited on 8 March 2019, at 15:34 (UTC).